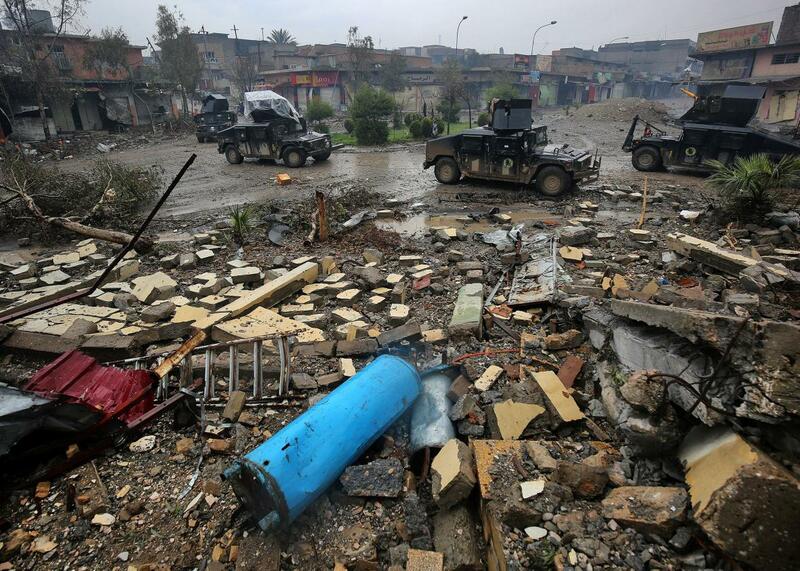 U.S. airstrikes may have killed as many as 200 civilians in Mosul. Iraqi counterterrorism service vehicles advance toward the Yabasat neighborhood on Thursday during their ongoing offensive to push Islamic State jihadis out of Mosul. The U.S.–led military coalition in Iraq is investigating reports that as many as 200 civilians were killed in recent airstrikes it carried out in Mosul. In the meantime, Iraqi military leaders have called for a pause in the push to retake Mosul from ISIS as things get clerared up. For now, the Pentagon has said that an initial review confirmed that airstrikes did take place on March 17 at locations where lots of civilians were reportedly killed when buildings collapsed. Investigators are now trying to determine whether the buildings collapsed because of the airstrikes or whether ISIS used the airstrikes “as an opportunity to detonate an explosive in the building,” reports the New York Times. A local lawmaker and two residents claim the airstrikes may have detonated an ISIS truck filled with explosives that was in the area, and that’s what caused several surrounding buildings to collapse. Rescue workers have pulled more than 140 bodies from the rubble of three buildings that collapsed in the aftermath of the airstrikes, and dozens more are thought to remain buried. If confirmed, it could mean the March 17 airstrikes were among the deadliest for civilians since the United States first invaded Iraq in 2003. The increasing concern about casualties in Mosul comes as senior military leaders are also investigating claims of large numbers of civilian deaths in two separate airstrikes in Syria. In total, as many as 350 civilians may have been killed, according to NBC News.